World-renowned German sports brand adidas has a glorious history in sports clothing, starting with their sponsorship of U.S. sprinter Jesse Owens at the 1936 Olympics. Since then, thousands of the worlds greatest athletes have donned the adidas brand - a testament to their enduring innovation. 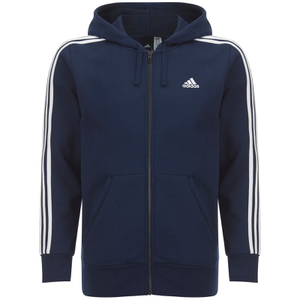 Men’s ‘Essential 3 Stripe’ navy full zip hoody from adidas. Crafted from soft climate® fleece, the hoody lifts sweat away from your skin to keep you cool and comfortable during training. The hoody is detailed with a signature logo on the chest, a double-lined hood and a two-coloured adjustable draw cord. Complete with split kangaroo front pockets, three iconic black stripes on the sleeves and ribbed trims. World-renowned German sports brand Adidas has a glorious history in sports clothing, starting with their sponsorship of U.S. sprinter Jesse Owens at the 1936 Olympics. Since then, thousands of the worlds greatest athletes have donned the Adidas brand - a testament to their enduring innovation. We've a great selection of their clothing here at zavvi.com, including hoodies & t-shirts. Make sure you take advantage of our outrageously good prices!